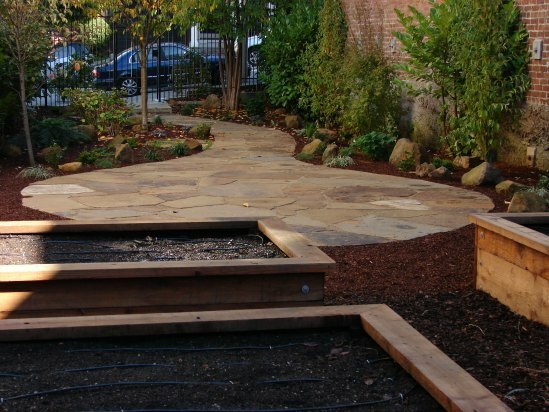 Landscaping a sacred space for learning and communal gatherings harkens back to the venerable practices of creating outdoor classrooms. Open-air learning was common in the cultures of the ancient Roman and Greece. Educators in those civilizations believed that learning was best accomplished when the students were outside and connecting with nature. 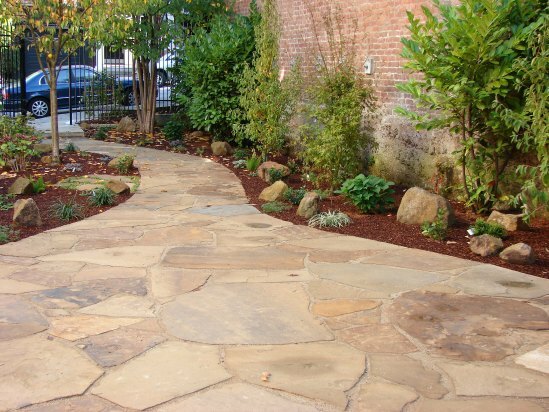 Transforming an area for that purpose -- an area that already has spiritual potency -- requires not only knowledge of landscape architecture and construction practices, it demands an intuitive understanding the unmanifest potential of the space. 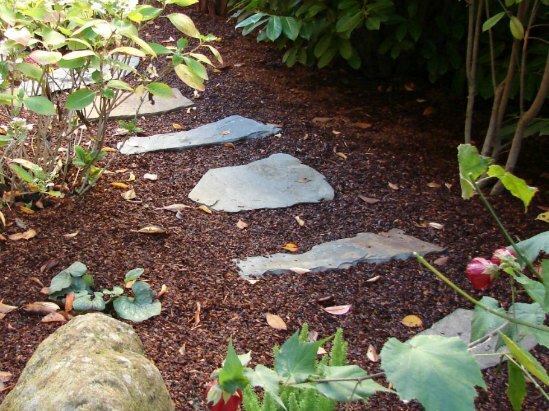 Our clients wanted their neglected church courtyard transformed into an outdoor classroom where students could learn about horticulture in a manner reminiscent of the ancient traditions of educating children in nature. Furthermore, they asked for a space that was open and flexible enough to handle large gatherings of church members for social events. When we arrived the area in question was neglected and overgrown with weeds. 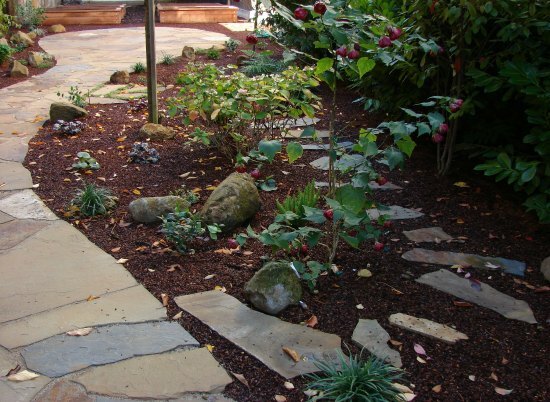 In addition, we found constricting elements including a significant portion of the space that was heavily shaded, creating a challenge for many plants. Nonetheless, Sarah felt the magical potency of the area and sought to bring forth its potential so that it could become a true genus loci- a sacred space. 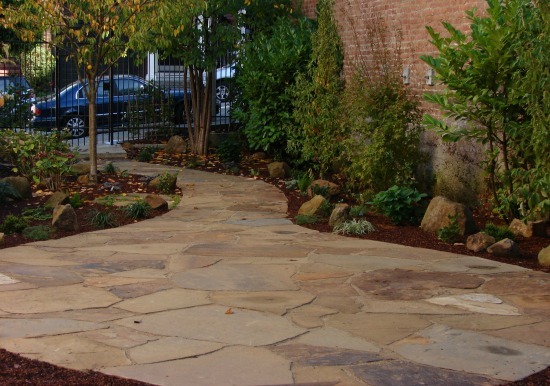 The first step in the transformation process was to reduce the impact of a towering brick wall, which was accomplished by putting in beautiful shade tolerant plants, namely Mountain Moon Dogwoods. 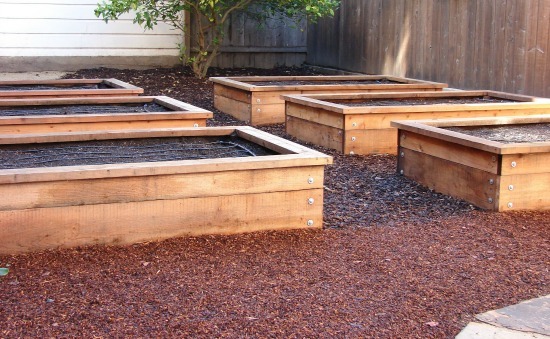 Then, in the sunny area we installed six custom-built redwood vegetable boxes. Because organic vegetables were going to be cultivated for consumption, all of our irrigation components were designed to introduce no plastic into the growing environment. 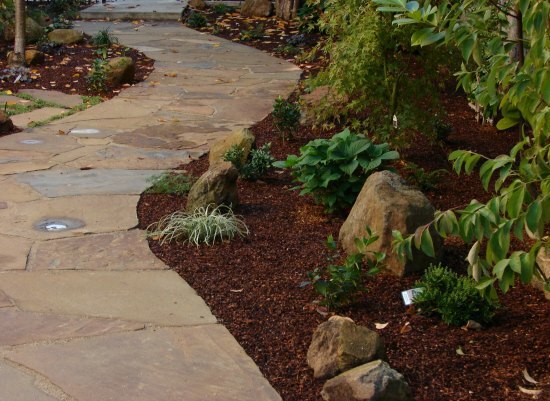 A meandering path of Mahogany Select Flagstone pavers leads to the heart of the garden. Here we created a central patio that was sized specifically for classroom gatherings. 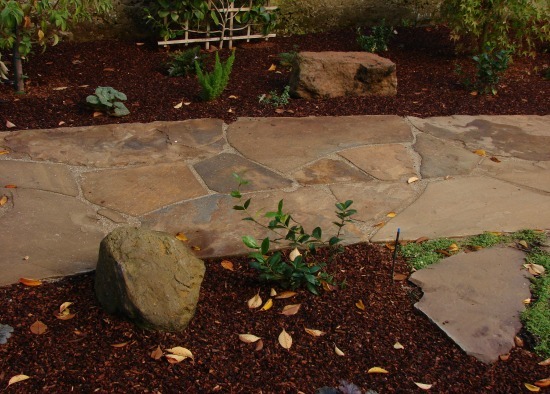 In addition, stones and boulders were added as secondary seating. Open pockets for additional seating were also included so that the space could develop as the church’s needs grew. Of course, the neighbors delighted when they were watching the transformation of an unsightly lot into an outdoor classroom. Even more enchanting was the second graders glee as peeked out the windows to witness the development of their outdoor classroom, anticipating the day when they could gather there. The magical spirit of this sacred space has now been fully realized as an outdoor classroom that invites learning and the celebration of community.